I was called out to inspect a Laguna Niguel skylight to try and figure out why the customer's ceiling was damaged by the edges of his skylight. After seeing the interior and assessing if he should call his insurance company or not I have to go up on the roof. Going up on the roof is always necessary if it can be safely done and if the roof is dry it should be safe. Getting a quote from someone who won’t get out his ladder and take the time to go up on the roof should be a red flag. When I go up on the roof for a roof leak inspection I am looking for broken tile, missing roof flashing, cracked or leaking skylight domes, or a sloppy roof install. The picture to the right shows what I first saw. The area around the roof had no apparent “visible” roof damage. I didn’t find any broken tiles, the skylight itself was in good shape, and all of the flashing around the skylight was there. If your skylight flashing is leaking don't waste your money paying someone to try and caulk it. You need your skylight flashing properly replaced. Here we have removed the tile and cleaned the area. All of the trash and roof debris are put into a “Green” re-usable bag (white bag to the right of the skylight). Here’s where we differ from most roofing contractors out there. At this most point some roofers will simply take some cheap roofer’s tar and start spreading over the areas where they “think” the roofing felt may be damaged. Then they just put the roofing tiles back over the old felt. That approach will save you money today and no doubt lead to a more thorough repair the next year. Another approach we see is where the roofer at this point decides to install new felt directly over the old felt. 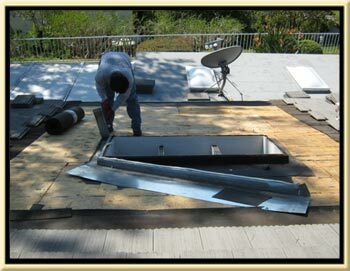 This is another short cut or band aid type of repair roof repair. If the roofer doesn’t check the deck how can you be sure there is no dry rot damage? If there is some dry rot they simply bury it under the new felt for a more expensive repair later on down the line. Also, if they didn’t take the time to remove the skylight dome and replace the roof flashing around the skylight that means they will have to install the new felt directly over the old flashing and that is not good for your roof. These are the flawed repaired techniques that can lead to moldy, dry rot damaged wood being left on your house and an improperly waterproof roof that will need to be repaired again in the near future at an ever greater cost. 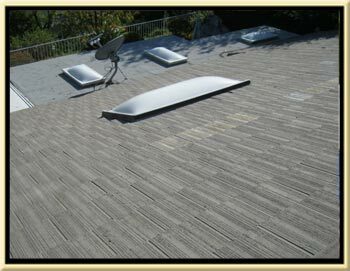 Here you can see we do take the time and do the all necessary steps needed to give you a long term roof repair warranty. We are about an 1 ½ hours into this repair and we have already removed the tile in a very large area around the skylight and carefully stacked it aside for later re-use, cleaned all of the debris under the tile and put it safely into a re-useable bag instead of blowing it into your backyard so you can later breath that stuff in. 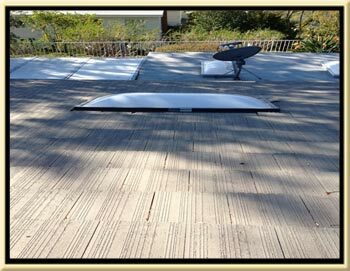 Removed all the leaking flashing, repaired the deck, pounded down all nails and loose decking edges. At this point your roof is now properly prepped for water shield (if you choose that option) new felt, and newly fabricated roof and skylight flashing to custom fit around your skylight curb. We are now several hours into the repair and nearing the end. We have nowcorrected all the problems that could not be seen during the normal roof leak inspection process. At this point in the repair we have done everything we have discussed but one thing we did not discuss was the overall height of the skylight curb. After removing the skylight dome, the roof felt paper, and the roof flashing we were able to see that the skylight itself needed to be raised about two inches. 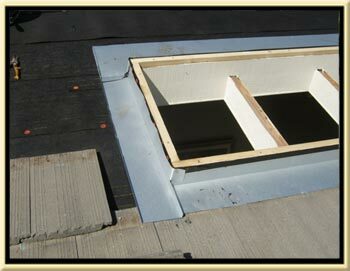 Skylights that sit too low off the roof deck surface have a tendency to leak during windblown rain storms. To do this we first removed the front piece of wood because it had dry rot damage. Instead of replacing it with the same sized piece of wood we replaced it with a piece that was one size larger on the height and that raised to front of the skylight to the proper height. Then we were able to add a piece of wood to each side and the back to make a matching and level height adjustment all the way around the skylight. The combination of removing the felt, replacing the dry rot or termite wood, pounding down all popped up nails, making any necessary decking repair to get the deck as flat and smooth as possible, removing the dome and fabricating new skylight and roof flashing, and picking up the height of the curb will allow us to warranty this area of the roof for years and years to come. This area of Rick’s roof will be the last area of his roof to ever leak again. After we tuned up the rest of the roof the life expectancy of Rick’s roof is now up 10-20 years from what it was before we arrived. The picture you see to the right is not the before picture but the after picture. 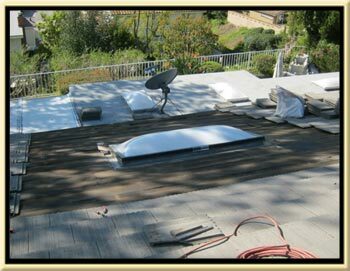 About the only hint that we repaired this skylight in Laguna Niguel, Ca. is that you can see some lighter colored tiles right behind the skylight. The roof tune-up work that we did after we finished this skylight repair was painting all of the roof flashing with Behr, Ultra, Paint and Primer paint that we custom matched a color for the roof (you should never let a roofer use spray paint on your roof) and we replaced and broken tiles, repaired and reset al slipped tiles, installed new mortar where the old was cracked or damaged, and left his job the same day we started looking like we had never even been there. If you live in Laguna Niguel, Ca and you are experiencing some damaged or a wet ceiling around your skylights then give us a call and we will come out and do the exact same job for you and your skylight leaks will be gone. We are a small roofing company that focuses on quality not quantity and offer the best possible prices we can with the maximum amount of professional service and attention the detail.